In Maya Hostel no strangers……………………..
Only friends there that have not been known before. The Maya Hostel Cancun is located in the historic center of the city, on Avenida Yaxchilan number 82 in the Zm. 25 M. 8, Poolside Agency FIAT cars, near the Parque de las Palapas and Avenida Tulum , where you take the bus to the spectacular beaches and nightclubs of Cancun's hotel zone and 15 minutes walk from the bus station (ADO), where buses depart daily to the airport, Chichen Itza, Playa del Carmen and Tulum. We are the ideal place to rest after the Cancun nightlife, with clean rooms, relaxing music and good coffee. We have spacious rooms with mixed-bed area and separate bedrooms for women and men, as well as private rooms for one, two and up to four people, and desks are decorated with Maya, have permanent connection Wi-Fi, Fans, private lockers for all guests, new shared bathrooms with shower and hot water all day and night. In the Maya Hostel Cancun we strive to keep all our areas clean and sheets and towels. We also include continental breakfast, complimentary drinking water, terraces and gardens for breakfast and meet other guests from all over the planet, specialized library on the Mundo Maya and Receive for 24 hours. Inside the hostel you can buy products for personal use as shampoo, toothbrush etc. Also Soft drinks, coffee and light lunch, among other things. On the other hand, we have a network of contacts with other hostels and offer tours and excursions in Mexico, Guatemala and even in the Republic of El Salvador so that through our hostel, you will enjoy all the wonders of the Mayan World. Because of its location, the Maya Hostel Cancun enjoys proximity to a variety of restaurants, craft markets, and the famous parks of downtown Cancun. An excellent place to spend your holiday and enjoy good company while in the Mexican Caribbean. We offer our new friends at Hostel Maya economic information about transfers from Cancun International Airport and VIP table reservations at the best clubs and restaurants in the area ensuring: Safety, Fun, atmosphere of peace and relaxation during your stay at Maya Hostel Cancun be at home. Consider this as your best option in Mexico. We have clean, safe and spacious areas, a kitchen, comfortable living room with books where you can drink a cup of coffee and a beautiful garden where you can enjoy the sun. Mundo Maya Hostel Cancun is in a building that has been completely renovated, so it is in excellent condition. 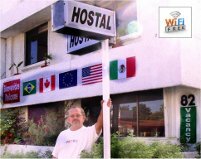 Our hostel is located in downtown Cancun a few minutes walk of the most important public squares and gardens of the city, as well as bars and restaurants.